Members of Beth El making a difference yet again! 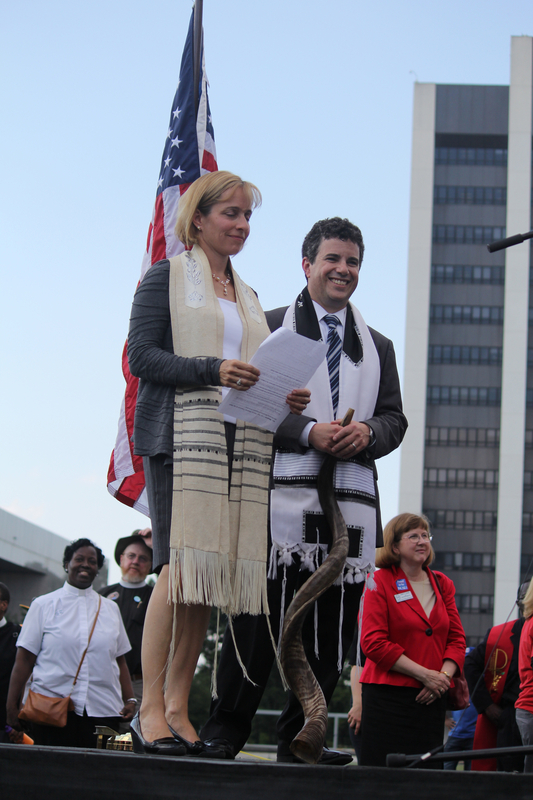 Rabbi Judy and Rabbi Jonathan wake up the crowd with their words and blast of the shofar. 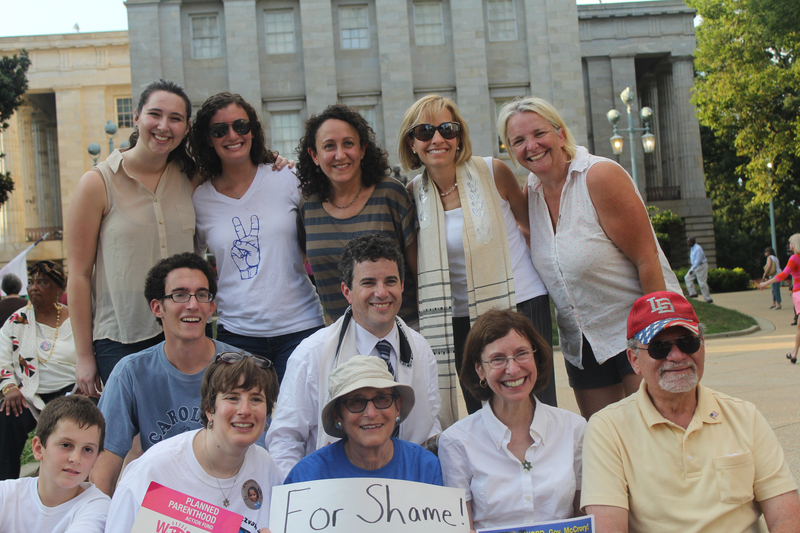 As the Hebrew month of Elul beckons, Rabbi Freirich sounded the shofar during the massive rally and interfaith prayer service in Raleigh, making it clear that it was time for all of us to wake up and use our voices to call for justice. A caravan of ten cars set off from Charlotte with thirty six travelers. Our group included several interfaith additions: Reverend John Cleghorn of Caldwell Presbyterian, former County Commission Chair, Jennifer Roberts, and Mary Nell McPherson, Executive Director for Freedom School Partners. 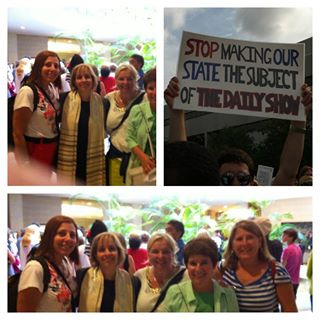 As part of the event, two speakers were selected from each region of our state to speak to a variety of issues. The strongest passion of the day was expressed for education. Teachers came from across the state en masse to vent their frustrations with last week’s extreme budget cuts, calling for respect and support for their vital profession on which our state’s future depends. “In Judaism, next Wednesday marks the first day of the Hebrew month of Elul. Every morning for a month, leading up to our Jewish New Year, we awaken our bodies and souls with the sound of the shofar. [Rabbi Jonathan sounded the shofar.] “Wake up! Change your ways! Get it right!” the shofar calls to us. As Judaism has done throughout the millennia and as Beth El done throughout the decades, may we always value and stand for education, our children and our future. Strengthening the Jewish souls of our congregation’s one thousand kids under the age of eighteen can be a challenge. Even though we have an outstanding, fun, dynamic and creative religious school at Temple Beth El (with more than one hundred madrichim staying on after B’nei Mitzvah to help in their high school years), there is only so much we can do with our kids attending just three and a half hours a week of Hebrew School and Religious School. Youth Group conclaves, trips to Israel, Jewish Day Schools, and Jewish summer camps all help to strengthen our kids’ Jewish identity. I am proud that we have twenty eight Beth El campers attending Camp Coleman and 6 Points Sports Academy this summer. This past Friday, as I visited Camp Coleman and our Beth El campers there, it became even clearer to me that Shabbat and Judaism are not subjects that can be taught only in the classroom, they must be lived. At our Reform Movement summer camps, Shabbat and Judaism are experienced, celebrated, and learned at the deepest levels. 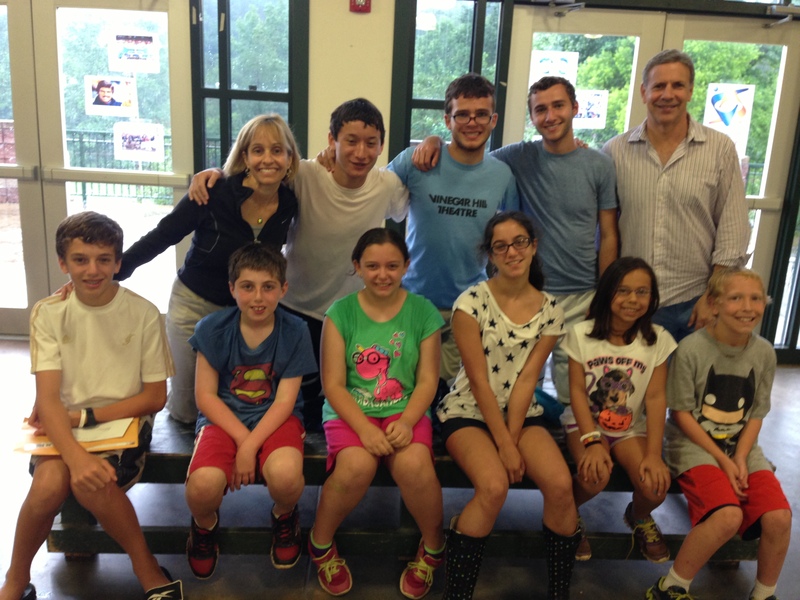 At our fourteen Reform movement summer camps, everything stops for Shabbat. 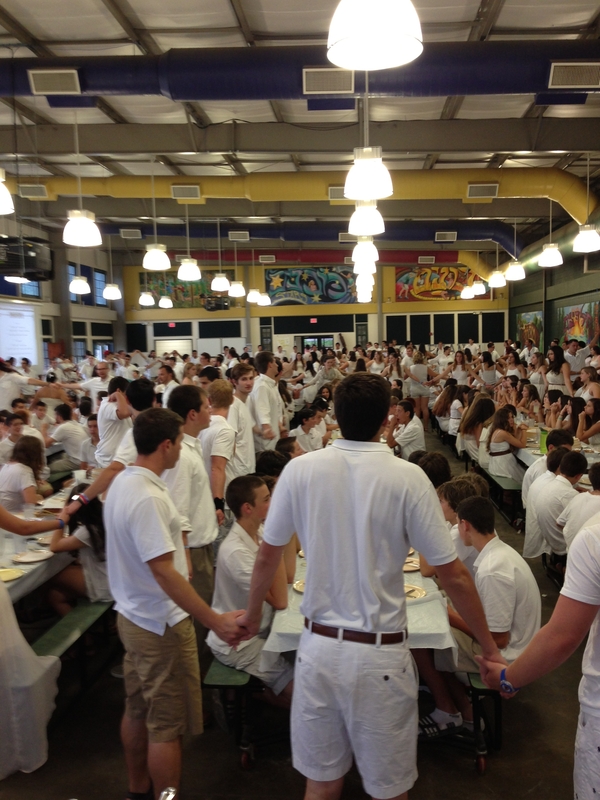 The entire camp dresses in white to convene for creative Shabbat services led by the campers and joined by enthusiastic teen and young adults song leaders. At Coleman on Friday, inspiring and humorous reflections on the week were offered through a weekly newsletter on the Dining Hall tables, an amazing weekly video show capturing their fun week in film, and dance and krav maga performances that shared what campers had learned. The night was topped off with a rowdy song session. On Saturdays at Coleman, campers have mandatory options: they have to do a fun activity of their choice such a playing on the lake on a paddleboard or floating trampoline or climbing the rock wall. Even though we are “People of the Book,” Judaism cannot be learned solely through study, it must be part and parcel of our daily experiences. As I took in the peace of Shabbat, the songs of our Jewish youth, and savored the community they were building, I offered gratitude for our Reform movement (URJ) camps that strengthen our kids’ Jewish identity so that they will feel a strong part of the Jewish people throughout their lives. I attended URJ’s Camp Harlam in Pennsylvania for seven years, worked at URJ’s Camp Swig in California for five summers and have been blessed to work on the faculty of Coleman for most of the past nine summers. I can see from my Facebook connections reflecting decades of camp friendships how those who were touched by Jewish camp continue to connect with and care about their Judaism. If you have a child, send them to a Jewish camp. If you don’t have a child, attend our Congregational Wildacres Labor Day Retreat or come on one of our Congregational Trips to Israel to strengthen your own Jewish soul. Or, help to teach a child, by giving to one of our youth funds that help our students take part in these experiences that strengthen their Jewish souls. 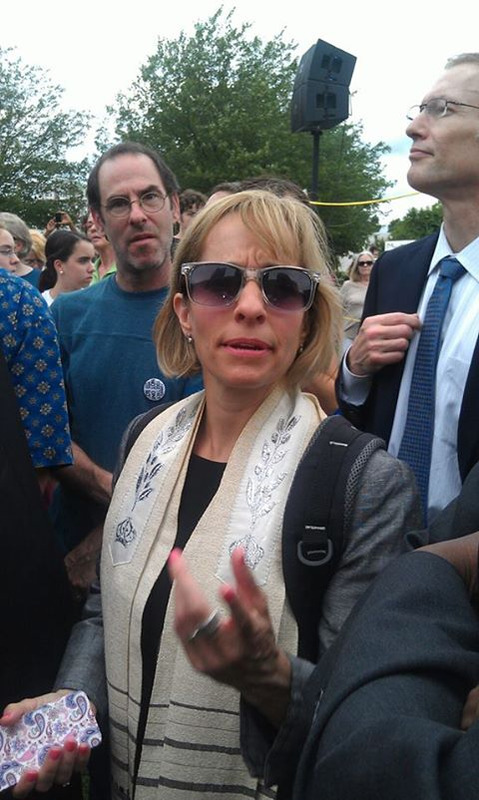 My name is Rabbi Judy Schindler and I am Senior Rabbi of Temple Beth El in Charlotte. 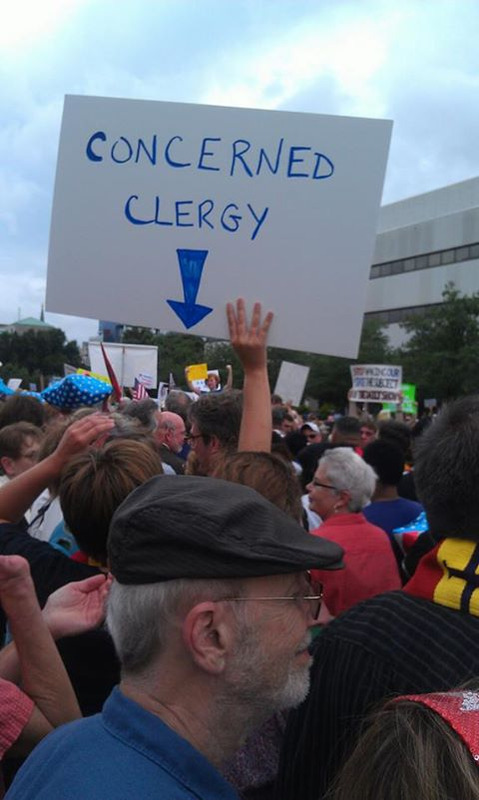 My congregants and I have driven many miles to be here today because North Carolina is our home and because we care. As Jews, our sanctuaries must have windows so that we can see the world outside. Our prayers should move us beyond ourselves so that we can see more plainly the plight of our world. That is what called us to join you today. As a congregation our social justice and action priorities are education, poverty, affordable housing, and domestic abuse. Our members give daily their time, talent and funds to lift up the needy as is in the Jewish tradition. In Genesis, God created all of us b’tzelem Elohim – in the image of God. B’tzelem Elohim – in the image of God we all were created. This tenet gives us responsibilities. We are required to create a world that supports, rather than subjugates others. We are called to honor the image of Divine in everyone. In 2012, there were 4,992 homeless children in our Charlotte-Mecklenburg schools. 600,000 children in our state live in poverty. I fear what today’s termination of unemployment benefits to 70,000 individuals will do. In the Jewish faith, the highest level of supporting the needy is job creation. We must invest in that goal. Yet when jobs are not to be had (there is 8.8% unemployment in our state, the fifth highest in our country), we are called not to abandon the needy but to provide for them. The problem of lifting up the impoverished cannot be solved alone by houses of worship working in soup kitchens and opening their social halls to the homeless. As faith communities, we are doing our part. We are relying on you, as State leaders, to do yours and not hurt the most vulnerable. We embrace the value of fiscal responsibility. We want to leave the strongest legacy for our children. Education is that key. Studies shows that children who do not read by third grade are more likely to drop out of school or be incarcerated later in life, yet as leaders, you have cut reading aids in the most critical grades. Education leads to employment. Education leads away from crime. Education is an economic investment. The Jewish tradition values teachers. According to the Mishnah we are meant to honor our teachers in the same way that we honor God. We are required to pay them liberally and to make sure that their classes are small enough so that they can effectively teach. You have limited teacher pay increases and taken away economic incentives for educational and professional advancement at a time when North Carolina is already 46th in the nation in teacher pay. The tenet means that we are endowed with qualities of understanding and discernment. Legislators of our State, we are pleading with you to use the minds and hearts you have been given to work in partnership with us to find a more positive path. You have chosen to pursue these political positions to make a difference – a value that we appreciate. Yet the sweeping decisions you believe will put us financially on firmer ground will have the opposite effect. The difference you are making is going in the wrong direction. Judaism values debate for the sake of a God. Please allow us to enter the debate with you, so that we can find a stronger solution. May we actualize our potential and use our partnership to lift our state educationally and economically and acknowledge the dignity and humanity of all.